Tetralogy of Fallot (TOF) with absent pulmonary valve is a rare congenital anomaly characterized by features of tetralogy of Fallot with either rudimentary ridges or the complete absence of pulmonic valve tissue and usually with a hypoplastic pulmonary valve annulus. Congenital absence of the pulmonary valve with an intact ventricular septum occurs, but this is much less common. The absence of mature pulmonary valve tissue leads to severe pulmonary regurgitation, which is often associated with massive dilatation of the proximal branch pulmonary arteries and which is characteristic of this syndrome. 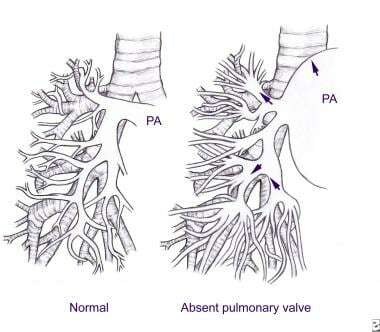 The image below compares the pulmonary artery branching between healthy patients and those with absent pulmonary valve syndrome. Pulmonary artery branching in a healthy person and in a patient with absent pulmonary valve syndrome. Tetralogy of Fallot is the most common cause of cyanotic heart disease and may occur at a rate of 1-3 cases per 1000 live births. However, tetralogy of Fallot with absent pulmonary valve is rare, with approximately 3% of patients with tetralogy of Fallot having the absent pulmonary valve syndrome. See Tetralogy of Fallot, Tetralogy of Fallot With Pulmonary Stenosis, and Tetralogy of Fallot With Pulmonary Atresia for more information on these topics. For patient education information, see Tetralogy of Fallot. Tetralogy of Fallot (TOF) consists of a malalignment ventricular septal defect (VSD), infundibular pulmonary stenosis, overriding aorta, and right ventricular hypertrophy (RVH). The absence of a functioning pulmonary valve gives rise to pulmonary regurgitation (insufficiency) that results in aneurysmal dilatation of the main and branch pulmonary arteries, which can compress the tracheobronchial tree (see the following image). In addition to compression of the larger bronchi, Rabinovitch et al described abnormal tufts of the smaller pulmonary arteries that compress the intrapulmonary bronchi. The investigators further reported a reduction of the number of alveoli. This may explain why surgical relief of the larger airway compression alone is not always effective in reversing the severe obstructive respiratory disease. Drawing showing absence of the pulmonary valve with features of tetralogy of Fallot. Note the small nubbins of tissue at the pulmonary valve annulus in the center of the drawing. Characteristic muscular right ventricular hypertrophy and infundibular pulmonary stenosis are present. A right aortic arch, a ventricular septal defect with overriding aortic valve, and massively dilated main and branch pulmonary arteries are present. The pulmonary valve annulus is usually hypoplastic, resulting in pulmonary stenosis. The stenosis is not typically severe and the pathophysiology in this condition is such that, after the immediate neonatal period, a net left-to-right shunt is observed. This and the airway obstruction due to the dilated pulmonary arteries are the hallmarks of the condition. In the immediate neonatal period, cyanosis may be present, which is a result of increased pulmonary vascular resistance (PVR) causing a right-to-left shunt at the level of the VSD or the inability to effectively ventilate the patient. After the fall in pulmonary vascular resistance, respiratory difficulties are the most prominent symptom in severe cases. Etiologic factors for tetralogy of Fallot (TOF) with absent pulmonary valve are not known in most cases. Chromosomal abnormalities, absence of the ductus arteriosus, and other theories have been proposed. Emmanoulides et al were the first to highlight the association of absent pulmonary valve syndrome with the absence of the ductus arteriosus. The investigators proposed a pathogenetic link between the lack of the ductus arteriosus and pulmonary artery dilatation and the absent pulmonary valve. They argued that, because most of the blood that enters the pulmonary artery does not have the usual egress through the ductus arteriosus, the blood returns to the right ventricle (RV) through the somewhat stenotic pulmonic annulus; thus, it contributes to the dilatation of the pulmonary arteries and the possible nondevelopment of the pulmonic valve. This blood then crosses the ventricular septal defect (VSD) to feed the lower resistance placental circulation through the left ventricle (LV). Others have postulated that agenesis of the ductus arteriosus results from obliteration of a still immature artery slightly later in development rather than from complete failure of a sixth arch artery to develop. Rabinovitch et al have suggested that some congenital weakness of the pulmonary arteries may be present, although the histologic findings are not specific. Some authors believe that the described changes are the result of increased wall stress similar to the changes seen in pulmonary hypertensive arteriopathy; however, no such wall abnormalities have been demonstrated in peripheral pulmonary arteries. Prognosis in patients with tetralogy of Fallot (TOF) with absent pulmonary valve is directly related to the degree of tracheobronchial obstruction secondary to pulmonary artery dilatation. Airway compromise is the predominant concern, including atelectasis, pneumothorax, and pneumonia. Neonates with severe respiratory distress soon after birth are most at risk for early death. Infants who require surgery early in life have a worse prognosis than those repaired at a later date. Mortality and morbidity rates in patients with tetralogy of Fallot with absent pulmonary valve syndrome far exceed those of patients with normal physiology who have typical tetralogy of Fallot. Patients are at risk for hypoxemia, heart failure, respiratory failure, and combinations of these events. The size of the pulmonary valve annulus and, therefore, severity of pulmonary regurgitation substantially influence patient morbidity and mortality. Patients with a smaller, more stenotic annulus are subject to risks akin to those of typical tetralogy of Fallot. Patients with a large annulus and, therefore, more severe pulmonary regurgitation are at greater risk of morbidity and mortality. Patients with severe bronchial obstruction develop symptoms in the early neonatal period. As the airways increase in size and strength, these symptoms may decrease. However, this usually cannot be expected to occur until approximately age 9 months. The newborn may demonstrate significant cyanosis until pulmonary vascular resistance (PVR) falls, after which the degree of hypoxemia reflects the severity of pulmonary annular stenosis. A larger pulmonary annulus produces less stenosis, and, therefore, intracardiac shunting may primarily be left-to-right, resulting in minimal cyanosis. The patient with more severe annular hypoplasia presents more similarly to the patient with typical tetralogy of Fallot. 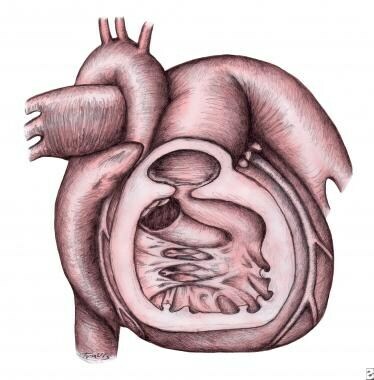 Congestive heart failure (CHF) can occur as a result of a large left-to-right ventricular shunt. This contributes to an enlarged left atrium, which, along with dilated pulmonary arteries, results in airway compression. The presence of significant tricuspid regurgitation also increases the risk of heart failure. In patients with more severe pulmonary regurgitation, aneurysmal dilation of pulmonary arteries can cause air trapping due to bronchial compression. This process can be localized or diffuse and may be severe. Yeager SB, Van Der Velde ME, Waters BL, Sanders SP. Prenatal role of the ductus arteriosus in absent pulmonary valve syndrome. Echocardiography. 2002 Aug. 19(6):489-93. [Medline]. Rabinovitch M, Grady S, David I, et al. Compression of intrapulmonary bronchi by abnormally branching pulmonary arteries associated with absent pulmonary valves. Am J Cardiol. 1982 Oct. 50(4):804-13. [Medline]. Tiller GE, Watson MS, Duncan LM, Dowton SB. Congenital heart defect in a patient with deletion of chromosome 7q. Am J Med Genet. 1988 Feb. 29(2):283-7. [Medline]. Horigome H, Takano T, Hirano T, et al. Interstitial deletion of the long arm of chromosome 6 associated with absent pulmonary valve. Am J Med Genet. 1991 Mar 15. 38(4):608-11. [Medline]. Galindo A, Gutierrez-Larraya F, Martinez JM, et al. Prenatal diagnosis and outcome for fetuses with congenital absence of the pulmonary valve. Ultrasound Obstet Gynecol. 2006 Jun 23. 28(1):32-39. [Medline]. Volpe P, Paladini D, Marasini M, et al. Characteristics, associations and outcome of absent pulmonary valve syndrome in the fetus. Ultrasound Obstet Gynecol. 2004 Nov. 24(6):623-8. [Medline]. Miyabara S, Ando M, Yoshida K, et al. Absent aortic and pulmonary valves: investigation of three fetal cases with cystic hygroma and review of the literature. Heart Vessels. 1994. 9(1):49-55. [Medline]. Iserin L, de Lonlay P, Viot G, et al. Prevalence of the microdeletion 22q11 in newborn infants with congenital conotruncal cardiac anomalies. Eur J Pediatr. 1998 Nov. 157(11):881-4. [Medline]. Emmanoulides GC, Thanopoulos B, Siassi B, Fishbein M. "Agenesis" of ductus arteriosus associated with the syndrome of tetralogy of Fallot and absent pulmonary valve. Am J Cardiol. 1976 Mar 4. 37(3):403-9. [Medline]. Ettedgui JA, Sharland GK, Chita SK, et al. Absent pulmonary valve syndrome with ventricular septal defect: role of the arterial duct. Am J Cardiol. 1990 Jul 15. 66(2):233-4. [Medline]. Berg C, Thomsen Y, Geipel A, Germer U, Gembruch U. Reversed end-diastolic flow in the umbilical artery at 10-14 weeks of gestation is associated with absent pulmonary valve syndrome. Ultrasound Obstet Gynecol. 2007 Sep. 30(3):254-8. [Medline]. Bergwerff M, DeRuiter MC, Gittenberger-de Groot AC. Comparative anatomy and ontogeny of the ductus arteriosus, a vascular outsider. Anat Embryol (Berl). 1999 Dec. 200(6):559-71. [Medline]. Lakier JB, Stanger P, Heymann MA, et al. Tetralogy of Fallot with absent pulmonary valve. Natural history and hemodynamic considerations. Circulation. 1974 Jul. 50(1):167-75. [Medline]. Smith RD, DuShane JW, Edwards JE. Congenital insufficiency of the pulmonary valve: including a case of fetal cardiac failure. Circulation. 1959 Oct. 20:554-60. [Full Text]. Freedom RM, Patel RG, Bloom KR, et al. Congenital absence of the pulmonary valve associated with imperforate membrane type of tricuspid atresia, right ventricular tensor apparatus and intact ventricular septum: a curious developmental complex. Eur J Cardiol. 1979 Sep. 10(3):171-96. [Medline]. Moon-Grady AJ, Tacy TA, Brook MM, et al. Value of clinical and echocardiographic features in predicting outcome in the fetus, infant, and child with tetralogy of Fallot with absent pulmonary valve complex. Am J Cardiol. 2002 Jun 1. 89(11):1280-5. [Medline]. Kawazu Y, Inamura N, Ishii R, et al. Prognosis in tetralogy of Fallot with absent pulmonary valve. Pediatr Int. 2015 Apr. 57 (2):210-6. [Medline]. Castaneda AR, Jonas RA, Mayer JE. Tetralogy of Fallot. Cardiac Surgery of the Neonate and Infant. Philadelphia: WB Saunders; 1994. 232-3. Chelliah A, Berger JT, Blask A, Donofrio MT. Clinical utility of fetal magnetic resonance imaging in tetralogy of Fallot with absent pulmonary valve. Circulation. 2013 Feb 12. 127(6):757-9. [Medline]. Salazar AM, Newth CC, Khemani RG, Jürg H, Ross PA. Pulmonary function testing in infants with tetralogy of Fallot and absent pulmonary valve syndrome. Ann Pediatr Cardiol. 2015 May-Aug. 8 (2):108-12. [Medline]. Wu W, Pang K, Lin Q, et al. Echocardiography in the diagnosis of patients with absent pulmonary valve syndrome: a review study of 12 years. Int J Cardiovasc Imaging. 2015 Oct. 31 (7):1353-9. [Medline]. Heinemann MK, Hanley FL. Preoperative management of neonatal tetralogy of Fallot with absent pulmonary valve syndrome. Ann Thorac Surg. 1993 Jan. 55(1):172-4. [Medline]. Takabayashi S, Shimpo H, Miyake Y, Onoda K, Amano H, Maruyama K. Postoperative prone position management of tetralogy of Fallot with absent pulmonary valve syndrome. Jpn J Thorac Cardiovasc Surg. 2005 Mar. 53(3):150-3. [Medline]. Shahid F, Siddiqui MT, Amanullah MM. Tetralogy of Fallot with absent pulmonary valve syndrome; appropriate surgical strategies. J Pak Med Assoc. 2015 May. 65 (5):467-72. [Medline]. Alsoufi B, Williams WG, Hua Z, et al. Surgical outcomes in the treatment of patients with tetralogy of Fallot and absent pulmonary valve. Eur J Cardiothorac Surg. 2007 Mar. 31(3):354-9; discussion 359. [Medline]. Stellin G, Jonas RA, Goh TH, et al. Surgical treatment of absent pulmonary valve syndrome in infants: relief of bronchial obstruction. Ann Thorac Surg. 1983 Oct. 36(4):468-75. [Medline]. Karl TR, Musumeci F, de Leval M, et al. Surgical treatment of absent pulmonary valve syndrome. J Thorac Cardiovasc Surg. 1986 Apr. 91(4):590-7. [Medline]. Snir E, de Leval MR, Elliott MJ, Stark J. Current surgical technique to repair Fallot's tetralogy with absent pulmonary valve syndrome. Ann Thorac Surg. 1991 Jun. 51(6):979-82. [Medline]. Chen JM, Glickstein JS, Margossian R, et al. Superior outcomes for repair in infants and neonates with tetralogy of Fallot with absent pulmonary valve syndrome. J Thorac Cardiovasc Surg. 2006 Nov. 132(5):1099-104. [Medline]. Hraska V. Repair of tetralogy of Fallot with absent pulmonary valve using a new approach. Semin Thorac Cardiovasc Surg Pediatr Card Surg Annu. 2005. 132-4. [Medline]. Sakamoto T, Nagase Y, Hasegawa H, et al. One-stage intracardiac repair in combination with external stenting of the trachea and right bronchus for tetralogy of Fallot with an absent pulmonary valve and tracheobronchomalacia. J Thorac Cardiovasc Surg. 2005 Dec. 130(6):1717-8. [Medline]. The authors and editors of Medscape Reference gratefully acknowledge the contributions of previous author Kurt Pflieger, MD, to the development and writing of the source article.